Give your family 365 days of inspiration! Spend a few minutes each day focusing back on God's Word with The Bible Is My Best Friend Flip Book. 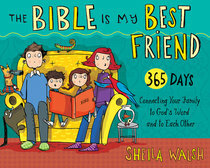 Placed on a desk, nightstand, or breakfast table, the Flip Book can be used in memory practice or as a daily reminder for families reading through its companion title, The Bible Is My Best Friend Family Devotional by best-selling author Sheila Walsh. The Flip Book is also a great standalone product for anyone who wants to revisit key scriptures daily or weekly. Combined with the other products in The Bible Is My Best Friend brand, the Flip Book offers your family another reminder of how God's Word can be their greatest friend. About "The Bible is My Best Friend Flip Book"